Although I have grown Peonies from seed, I bought the plant pictured here as a two year old seedling at an AGS plant stall. It was re-potted into a larger pot in a 50:50 mix of grit and potting compost with added Blood, Fish & Bone. It was re-potted each year, with no additional feeding after the initial BFB; eventually to a 26cm pan. It took a further three years to first flowering. There was one flower, the next year two, then none, but last year it was looking promising, and produced fourteen blooms. They opened just a week before the Ulster Show, and by keeping it in cool air they remained in excellent condition – I was delighted when it won a Farrer Medal! Peonies are found across the northern hemisphere, from China through the Northern Mediterranean to a few species in Western North America. 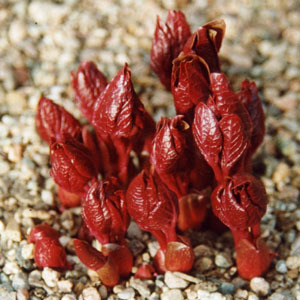 Paeonia cambessedesii is a native of Majorca and Menorca, where it is being endangered by development as well as the taste goats have for its buds (below). It is named for the 19th-century French botanist Jacques Cambessèdes (1799-1863). 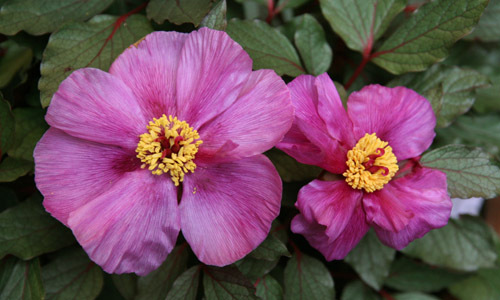 Peonies are rhizomatous and spend their winter in dormancy. Although from Majorca, I have found P. cambessedsi relatively hardy. I keep the plants covered for most of the winter, insulated by peat in polystyrene fishboxes from November to April. 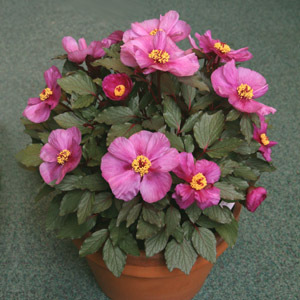 They are kept relatively dry in winter, with a first watering in February, and watered when taken out in the summer. Seed which I sowed in 2000 has produced several seedlings, with variation in flower colour, one of which was a prizewinner in the seedling class in Dublin this year.